Over the coming weeks, programs will begin ranking students and making their final admissions decisions. Given the competitive nature of each of our programs, some will fall short of their goal. We understand the pressures and demands that face many of our students. Admission into a program can often be life-changing for a person seeking a better life for themselves and their family. Students are ranked based on a spectrum of indicators. Not surprisingly your performance on your prerequisite courses, specifically your science grades are the most critical factor for most programs at the Medical Education Campus. Other factors include your results on the ATI TEAS test. Our post, “Am I a competitive applicant” delves into the competitive criteria for programs at the MEC. Having the minimum requirements for any program places a student on the margin. Meaning that if the applicant pool is competitive, they will be the first to be passed over. Because our programs do not have wait-list, an applicant competes every year they apply. If that student does not improve a grade, or a TEAS result or acquire more hours or complete co-requisite courses, they will not move themselves up on the rankings. Students who apply and do not satisfy the minimum entry requirements will be rejected automatically. You may have an impressive GPA or TEAS results, but if you are missing a requirement or attachment, an application will be denied. Visit our post on what might get your application rejected to learn more. If you were not accepted and are planning on applying again, ask yourself where was I weakest on? The categories that different programs look at can be distilled into the following list. Improving on one or all the above will increase your applications chance of acceptance in the next cycle. Applications are compared to the criteria established by a program by Student Services staff. If an applicant does not meet the minimum standards, an advisor will mark that application ineligible. This excludes that applicant from the ranking and pool of applicants that will be considered for admission into a program. It is essential that an applicant satisfies all minimum criteria before they proceed with any application. For programs that require observation hours failing to meet their minimum will result in an application being marked ineligible. For programs with mandatory in-person information sessions, not having gone or not having gone within the last year, is grounds for being marked ineligible. GPA at last school attended and/or NOVA GPA below the established minimum. 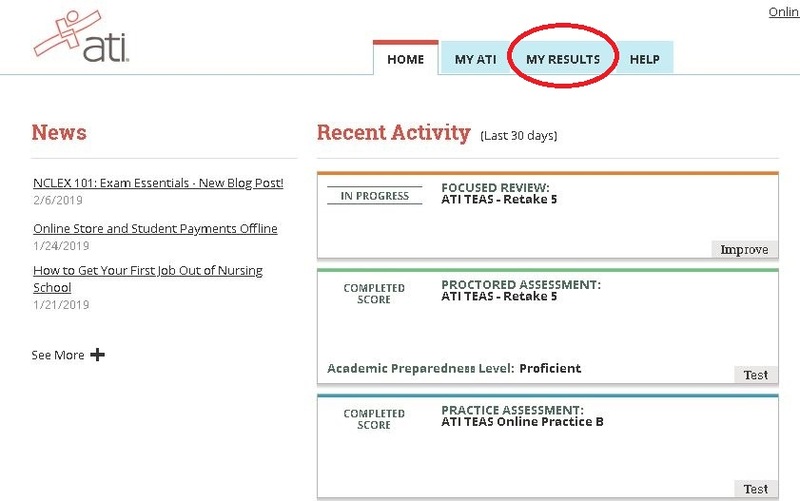 For Fall 2019 Nursing applicants TEAS scores must be from the period December 3rd 2018 to March 20 2019. Any scores from outside of that period will not be considered. Test Scores are older than allowed for your program. Please check our ATI TEAS post for the time frames. If your application was marked ineligible, it will have been for one of the above reasons. Students are invited to correct any errors they may have made and apply during the subsequent application period for their desired program of study. Please review our FAQ to learn how to avoid any pitfalls that will prevent your application from being considered in the future. You can learn how to be a competitive applicant here. Am I a competitive applicant? One of the most common questions that come into the office is, “Am I a competitive applicant?” The answer is almost always it varies. Some programs might accept all eligible applicants one year, and the next only have room for 10% of the qualified applicant pool. That question is also tied to its sister, “Why was I not accepted.” Due to the limited availability of clinical rotations, our programs can only accept but so many students. This will mean that many well-qualified applicants will apply, but not all will be admitted. Students meeting that just meets the minimum requirements are the most at risk of not being accepted. Likewise, if you were a well qualified applicant, but applied to a high demand program it may be that your domicile status placed you behind other students. 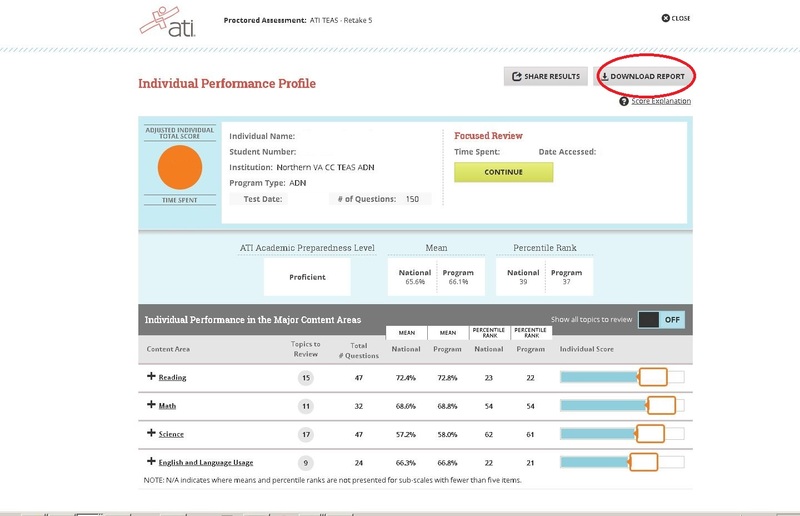 Some programs outline the criteria that are used to rank and select their students. Where available we have included the criteria used by a program. 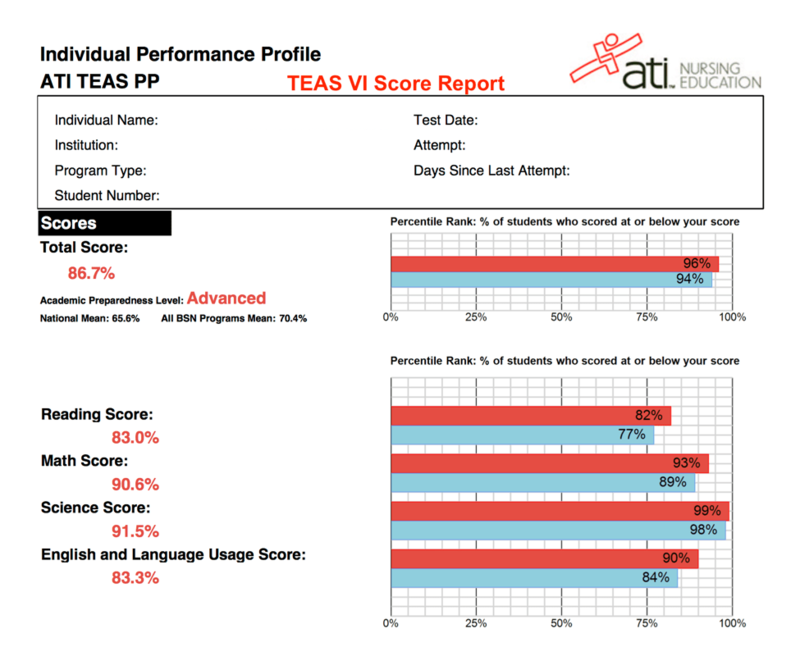 In general science courses and/or prerequisite courses and ATI TEAS scores are used to rank students. That, however, is not the case for all programs. Where available we have indicated a programs competitive criteria and source of information for your review. Letters of recommendation resumes and personal statements are not used in the admissions decision for any program. The number of observation hours and/or work hours with an OT or OTA based on signed and dated form(s). Points are awarded after completing 25 hours or more. Due to limited laboratory, classroom and/or clinical space, certain programs have restricted enrollment. As stated in the NOVA catalog, students are accepted on either a competitive or a first-come/first served basis. International students requiring form I-20. 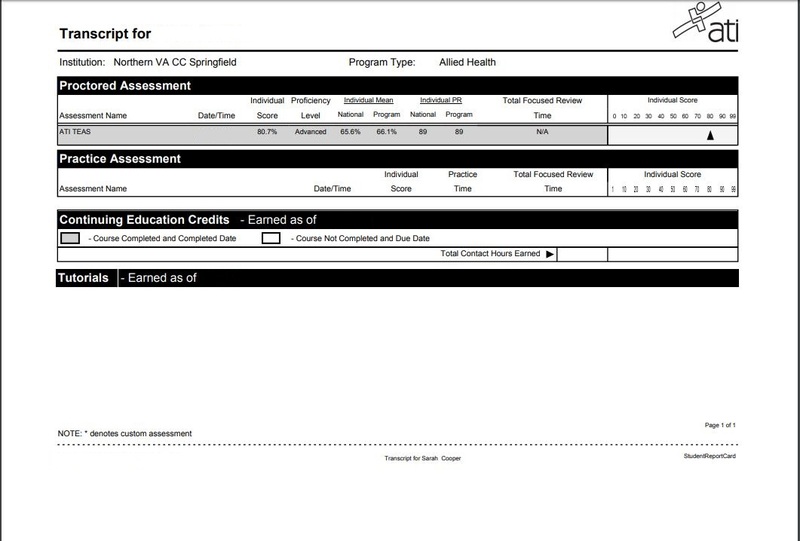 Category 1 may include areas in which clinical affiliates have contractual agreements with NOVA or students from other VCCS service areas whose community college does not offer the specific program. Residency and citizenship/visa status will be verified using the current information on file in the Student Information System (SIS). Level I and II domiciliary decisions and appeals are reviewed and determined by Campus Registrar and Dean of Students. Applicants may be asked to provide additional information or documentation before acceptance to the program is considered. If a program received enough eligible applicants from the first priority group, no students from the subsequent groups will be accepted. Regardless of how competitive they are otherwise. As a result, your likelihood of acceptance as an out of state or “F-1” student drops as the applicant pool grows. However, there have been students accepted from every priority group among the programs offered at the Medical Education Campus. 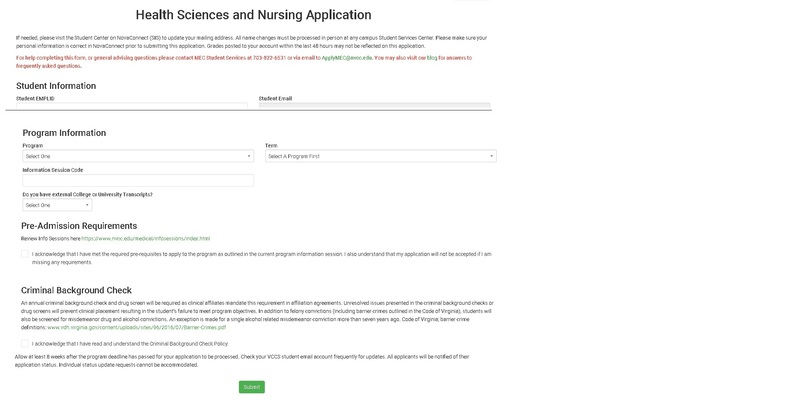 For the 2019 Fall Nursing program application, the following must be included in your online submission. You should only submit the following items unless otherwise directed to do so by the application team via email. 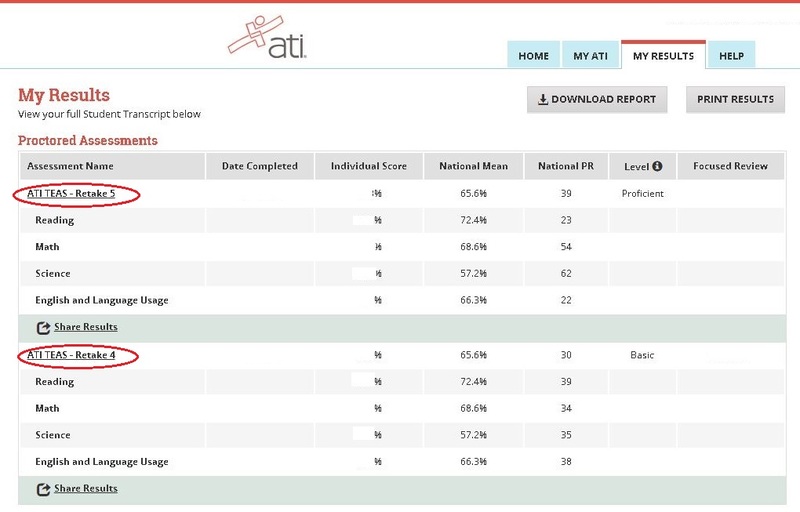 You can scan your high school transcript and save it as a PDF. This high school pdf document should be attached to your application if you have not already submitted in the past. Do not assume that NOVA has your transcript. UNless you provided it NOVA will not have it. If you have already submitted a high school transcript you are not required to do so again. However, ATI TEAS must always be attached to your application submission. DO NOT attach any information about the background check. The nursing department is given this information directly by Castlebranch. High School Transcripts Required for MEC Admission Applications: Request Them Early! As we begin the next semester, it is an ideal time to reflect upon your educational goals and to think about how you will go about achieving them to make this your most successful academic year yet. For those of you interested in applying to one of our Medical Education programs, one of the success strategies you may wish to employ is early preparation of your Health Science or Nursing application package, which for some means gathering a few extra required documents. If you were not already aware, a couple of the programs offered at the Medical Education Campus require that students submit additional documentation along with their admission application. In particular, Dental Assisting and the Nursing program require submission of your high school transcript showing the date of graduation and, for Nursing, specific coursework with final grades. To answer a common question we advisors frequently hear: Yes, submission of a high school transcript for these programs is required regardless of whether or not a student has previous college credit or has already earned a college degree. Because there could be a delay in obtaining your high school transcript for any number of reasons, you will want to begin this process early so that you will have a complete admission package when it comes time to apply to your program of interest. Those of you who have graduated from a high school within the United States will want to begin by contacting your high school and inquiring about the steps you need to take to have an official transcript mailed to you or how you may be able to pick one up. If you earned a GED and need to request the certificate, you will want to contact the Department of Education in your home state and request an official copy be mailed to you. For international students, you will also want to begin by contacting your high school and inquiring about the steps required to request and obtain an official transcript; however, prior to submitting them to NOVA, you will need to have them translated and evaluated for U.S. equivalence by one of the agencies listed in our FAQ. *NOVA will only accept international high school transcripts that have been translated and evaluated. We understand that in some situations it may be difficult to obtain your international transcripts and to have them evaluated for U.S. equivalence. 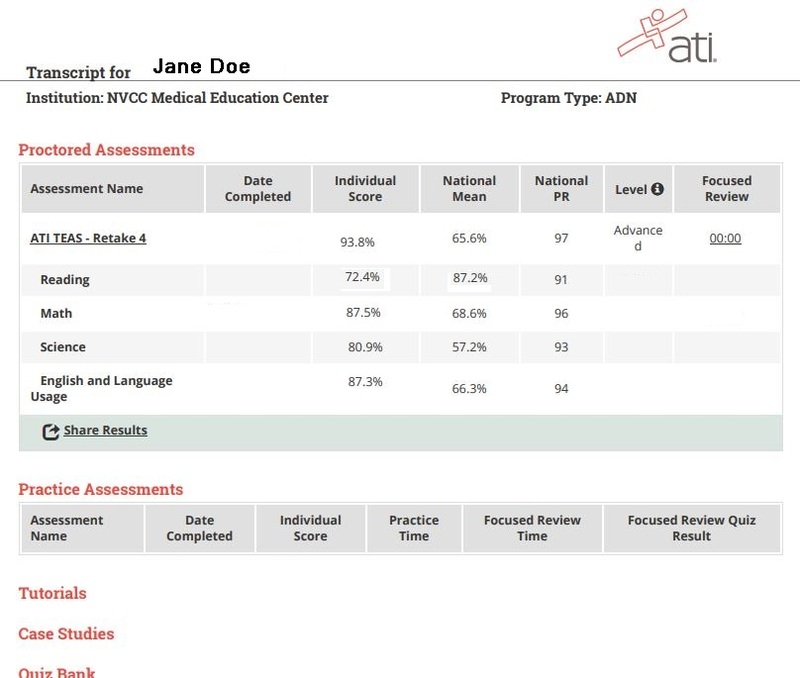 Under these circumstances, a student will need to take the General Education Development (GED) test and, if you are applying for admission to any of the Nursing tracks, complete the following courses either by taking classes at NVCC or through Nursing ABC: BIO 101, CHM 101, and MTH 154 or higher. To explore the opportunity to complete courses through Nursing ABC, please visit: www.nursingabc.com. So, remember: plan ahead, prepare early, and make this your most successful academic year yet! Best of luck in all of your academic endeavors!